Associate Manager Niranjan Silva of the NDB Central Sales Team was felicitated with the Silver Award for the Best Territory Manager at the Grand Gala Awards Night by the SLIM 2018 edition of the National Sales Congress (NASCO). Niranjan Silva was bestowed with this award in recognition of his extraordinary performance, determination to succeed and unwavering commitment to NDB. SLIM NASCO Awards 2018 recognised and rewarded the nation’s top sales forces and most outstanding sales performers for the 18th consecutive year. Running under the theme ‘Sales Builds Professionals’, the premier awards ceremony featured 750 sales professionals representing 116 organisations across 22 industries. Structured to recognise sales expertise across a variety of industries and job scopes, the awards program comprised of six categories, namely, the National Sales Managers category, Regional Sales Managers category, Territory Managers category, Sales Executives category, the Front liners category and Other Sales Staff category. 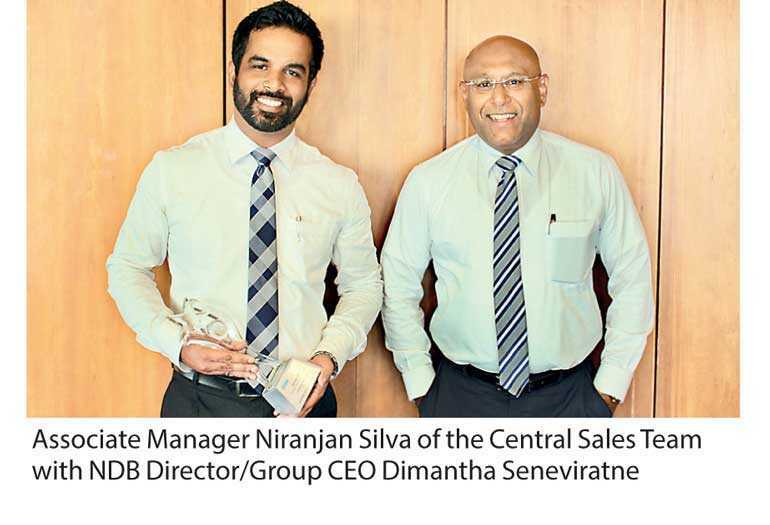 This awards program which celebrated Sri Lanka’s most eminent sales teams and experts, whilst providing a platform for corporates and individuals from across the island to showcase their talent and prowess in the sales arena felicitated NDB’s Niranjan Silva with the Silver Award under Territory Managers category. This award is a testament of the dedication, hard work, and commitment the NDB Sales Team has towards offering the best of services to the Bank’s valued customers. Niranjan Silva – who is an enthusiastic participant in the Bank’s extra-curricular activities, including the Bank’s Official Band ‘Skillart’ – is the team leader for the Central Sales Team ‘Go Getters’. The Bank’s Sales team consists of young and independent employees who have a solid career foundation in banking where NDB assists them in their personal and career growth. As an employer of choice, the Bank’s unique employee value proposition includes competitive remuneration and numerous opportunities for career and skill development in a dynamic and challenging environment. NDB is strengthened from the diversity of its workforce which is characterised by relatively high female representation, a diverse set of skills and varied industry expertise. NDB has made considerable strides towards the Sri Lankan banking and finance sector, expanding and evolving a range of products and services accessible through its growing branch network. Further details on NDB’s many products can be obtained from its 24 hour Call Centre, by calling 011 244 8888, visiting the nearest NDB branch or by visiting NDB Bank’s website on www.ndbbank.com.